The vote upheld decisions by the San Francisco Arts Commission and the Historic Preservation Commission to remove “Early Days,” a monument near City Hall depicting a vaquero and a missionary looming over a Native American. A didactic plaque will replace the statue, which is one part of the Pioneer Monument, a group of 19th century sculptures. "Early Days" will be placed in storage. 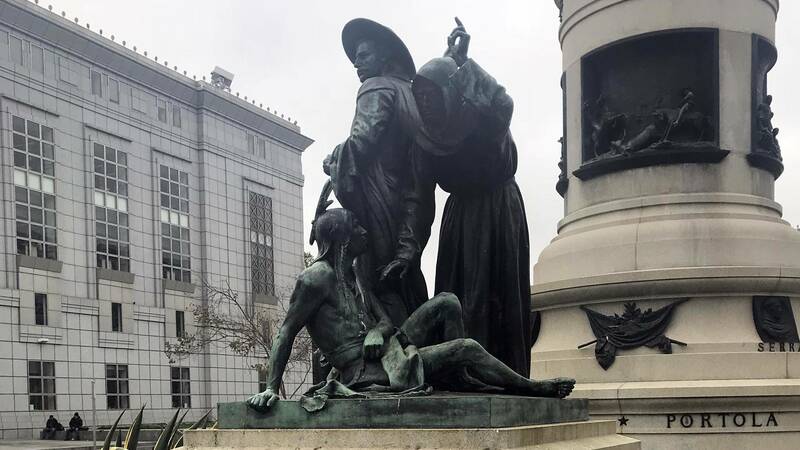 “The San Francisco Arts Commission can now move forward with the removal of this racist and disrespectful sculpture, which has no place in our city,” reads a statement from the agency. “The Arts Commission heard the public outcry against the imagery represented in the ‘Early Days’ sculpture and took the appropriate steps to help rectify an historic injustice,” added Director of Cultural Affairs Tom DeCaigny. Efforts to remove “Early Days,” which critics call degrading and historically inaccurate, began decades ago and renewed last year amid a national movement against Confederate statues and other racist monuments. “We should not have the statue in Civic Center any more than we should have a statue of Robert E. Lee,” former Mayor Ed Lee said in 2017. Flyers headlined “TEAR DOWN WHITE SUPREMACY” invited locals to voice their objections at the hearing, and dozens of speakers, most of them Native American, decried the statue during public comment. They pointed out that it erroneously depicts a Plains Indian, and invoked the systematic genocide and cultural repression visited upon Native Americans by Europeans—a legacy they said the statue celebrates and carries forward. Stephen Schmid, an attorney in Petaluma, challenged the preservation commission’s decision, calling its removal “tantamount to destruction” at a Board of Appeals meeting in April. “We are not the Taliban,” he said. “We do not go and destroy ancient Buddhist temples.” The board at first voted to block the preservation commission’s decision, prompting outcry from then-Mayor Mark Farrell and the Board of Supervisors. 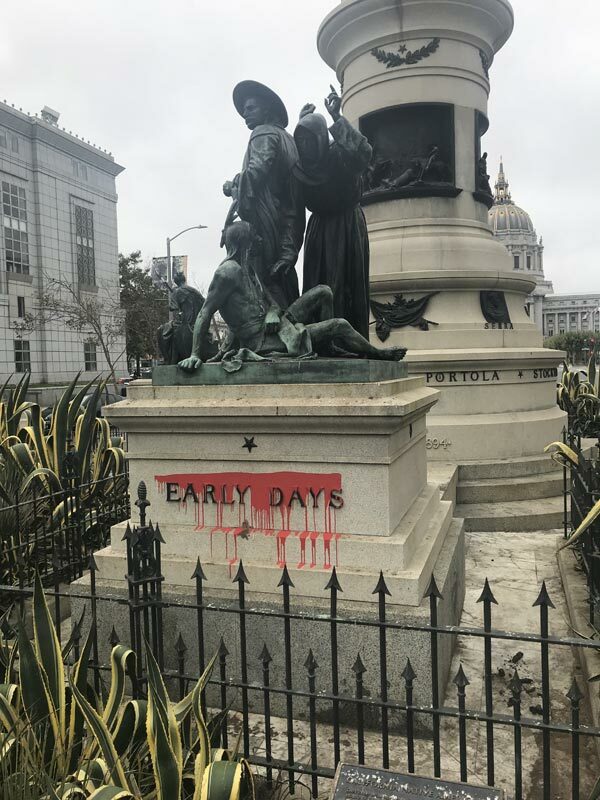 In recent months, props and signs emphasizing the statue’s racist symbolism have appeared on “Early Days.” Currently red paint drips like blood from the title at its base.